This is the Brent Black hat I had made last year and that a reader reminded me I had yet to report back on. I apologise, and can only plead a queue of other projects. Back in August I wrote about Brent Black himself, the craftsman and campaigner, who lives and works in Hawaii. His is the kind of business that makes me glad I live in the internet age. It is innovative, unswerving in its dedication to quality, and only possible because the internet allows Brent to connect directly with the few dozen customers around the world who are willing to pay for his uncompromising product. It allows him to bypass the economics of the rest of the industry, which have relentlessly undermined quality in favour of quantity. I then wrote a post later that month about the hat-making process. In some ways it contains the best of all other crafts, requiring an involvement in everything from sourcing plant shoots fitting the human head. Perhaps I am recapping these posts because there is relatively little to say about the finished hat. It is beautiful, perfect in every way. 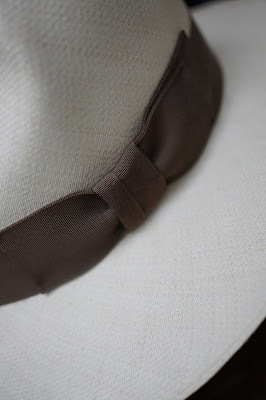 When it arrived it wasn’t perfect: it had a black hatband around it rather brown, as requested. But Brent went to extreme pains to correct that as swiftly as possible. And it is perfect now. 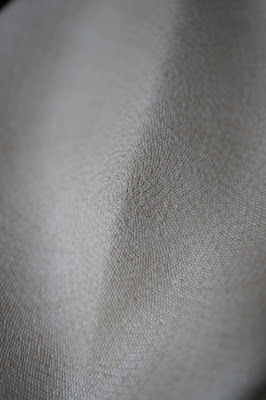 It is hopefully possible to see the fineness of the weave on the hat. I am not obsessive enough to count the number of rows per square inch, but I have never seen anything finer, including on hats that are a lot more expensive (this is Brent’s $1000 level of quality). The fit is also a delight. As a man with a ‘long oval’ head, most hats do not fit very well until they have been reblocked to that shape, or worn enough times to adapt. Most felt hats will do that relatively quickly, but they are still never perfect, the brim always buckling slightly along the sides. Even at the much cheaper end of Brent’s range (his hats start at around $500) I would recommend him for the impressive fit and dedication to the finished product. 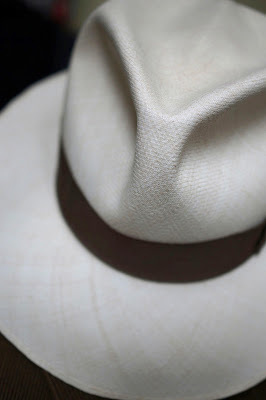 You can follow the discussion on Final panama hat from Brent Black by entering your email address in the box below. You will then receive an email every time a new comment is added. These will also contain a link to a page where you can stop the alerts, and remove all of your related data from the site. Interesting. I purchased, about a year and a half ago, a roller Panama from Bate’s at Hilditch and Key. I was impressed with the quality however about 6 months after extensive use in India it began to crack. I was, truly, incredibly dissatisfied with this and took it back to them. They promptly refitted me and subsequently replaced the hat. While I am sure it is not of finest quality that Brent’s are it has served me well and the price of 150 or so pounds has been satisfactory, especially considering that they are willing to replace it if the quality does not live up. Also I am wondering whether or not it is too garish to fit a colourful band to a hat such at this? I have a black band and as a young underacheiving man would not want to appear garish with a colourful band, but is it not too much to do so? I apologise if this is not typed particularly well but I have just retired after a long Easter lunch whilst watching Zulu. I wouldn’t go with a bright band, but something dark and with a little colour, perhaps a dark green, or a bronze? I have 64cm head. What tips would you give someone with a big ol’ noggin who is looking to purchase a hat in the UK, style wise, and who would you recommend visiting? Brent Black hats are truly wonderful. I’m on my second after having worn my first one to shreds over many years. Appreciate if you would share some insight on how do we( potential customer) get to get the right fit,in this case a Panama hat from Brent Black, of a hat.I personally am quite skeptical about ordering on line.Send back and forth is real hassle. I had a few corespondent with Brent black,but decided to hold on my order,until I have gather some relevant information,my utmost concern is the fit,not the prize. I completely understand your concern – it would be my biggest concern too. Brent’s system is very good though, involving sending you five hat bands very close in size, so you can find the best fit. I’m only one case, obviously, but it worked perfectly for me. Thank you.I’ll proceed in due time.They did mentioned that they have few clients in Malaysia(dont know them)golfers maybe,never bump into anybody wearing one in town. It worked perfectly for me, too–twice! Brent Black’s not a very large outfit. If there are any concerns, I’d email him. You’ll get a pretty prompt response. Thank you for such an interesting review. I can only echo your points; Brent made me a Monte Carlo about five years ago. As the weather was (for once) decent today, I got it out, as well as one from a well-known London maker (who shall remain nameless, but who I used before I discovered Brent Black). The quality of Brent’s hat is so far above the other that it is beyond belief – back-woven brim, rather than cut and stitched, fineness of weave fit…everything in fact. Even at the $500 level. I’m a new reader of your useful website that I’ve discovered thanks to Parisian Gentlemen (I’m keen reader) when I tried to find some articles about Panama hats. I like your website and you can from now consider me as one of your reader. Based on what I’ve read from your website about Brent Black, I’m planning to order one Panama hat from him. As far as I understood the hat that you have ordered is the one at 1000$. Do you know the fineness of its weave (Number of straw rows per sq inch)? Can you please tell about the color. Is it really as light as shown in the photos? Could you tell how many days has taken the shipping to UK from Hawaii? This was a while ago, but yes that’s right on price and I remember the straws per inch being in line with Brent’s guide for the different prices on his website. I hope that’s helpful. Oh, and yes it is that light but has mellowed slightly with age. And i’m afraid i can’t remember how long it took to come. I just received my beautiful Brent Black Classic Fedora. I spoke with Brent himself for quite a while after receiving my Fedora to get instructions on the care of his master piece. He told me how to handle it without compromising its integrity, what to place it on when I’m not wearing it, and the storing of it. He highly recommended that I place orange peels into its storage box during the months I don’t wear it. The peels provide just enough moisture to prevent the drying out of the straw.